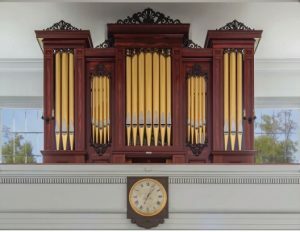 On Nov. 4, First Parish Church, Unitarian Universalist in Duxbury will present a free concert and reception to celebrate the completion of a nearly half million-dollar project to restore, rebuild and expand the church’s 165-year-old pipe organ. The organ, which was built by Boston organ-builder W.B.D. Simmons in 1853, is regarded as an outstanding example of the 19th-century Boston school of mechanical, tracker-action organs. It was originally bought partly with funds from church fairs held in 1851 and 1852. The annual summer fair continues to this day, making it one of the longest-running church fairs in New England. The candlelight concert, which will begin at 7 p.m., will include music for organ, woodwinds, brass quintet and a special appearance by the Zamir Chorale of Boston. The organists will be First Parish Church music director Edwin Swanborn and Brian Jones, formerly music director and organist of Trinity Church in Boston. The concert will be followed by a wine and cheese reception. Admission is free. The restoration project involved disassembling the organ and moving it in pieces to the Andover Organ Company shop in Methuen, Mass., where workers spent nine months rebuilding it. In the process, additional pipes were added to replace ones removed in a previous restoration and to increase the musical range. The project was conceived and overseen by Edwin Swanborn, who has been the church’s organist and music director for nearly 50 years. The price-tag for the restoration and expansion of the organ itself was $465,000. Alterations in the choir loft to accommodate the expanded organ brought the cost to just under $500,000. The funds came from church resources and generous donations by church members and members of the surrounding community.